When a new version of JHipster is released, the JHipster upgrade sub-generator helps upgrading an existing application to this new version, without erasing your changes. For this sub-generator to work you need to have git installed from http://git-scm.com. 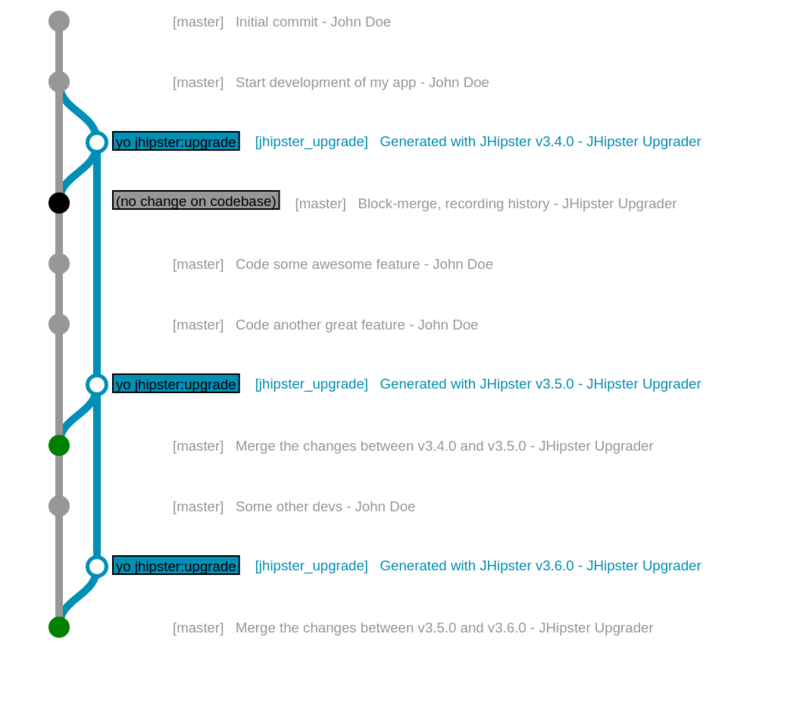 With doing the above you upgrade the jhipster_upgrade tree with your latest changes so JHipster can make use of that during the upgrade. For example when you changed your model. Please note that the jhipster_upgrade branch will be created orphan on your project, although it doesn’t display correctly on the above graph. Check if there is a new version of JHipster available (not applicable if you are using --force). Check if the application is already initialized as a git repository, or else JHipster will initialize one for you and commit the current codebase to the master branch. Check to ensure that there are no un-committed local changes in the repository. The process will exit if there are un-committed changes found. Check if a jhipster_upgrade branch exists. If not, a branch is created: details about this step is provided in the “Specific steps executed on first upgrade” section. Upgrade JHipster to the latest available version globally. Clean the current project directory. Re-generate the application using the jhipster --force --with-entities command. Commit the generated code to the jhipster_upgrade branch. Merge the jhipster_upgrade branch back to the original branch from where the jhipster upgrade command was launched. Now you just need to proceed with resolving merge conflicts if there are any. Congratulations, your application is now upgraded with the latest version of JHipster! The whole application is generated (using your current JHipster version). A block-merge commit is made on the master branch: no alteration is made on your codebase on the master branch; this is just a practical way to record in Git that the HEAD of master is up-to-date with the current JHipster version. Don’t commit anything on the jhipster_upgrade branch. This branch is dedicated to the JHipster upgrade sub-generator: each time the sub-generator is run, a new commit will be created. This offcourse does not account for the above tip for upgrading more than once.